Family Guy may be crude but it’s also a show that has a big heart, something that was clear in their recent tribute to Adam West. West, who was best known for playing Bruce Wayne/Batman in the iconic 1960s television series, became a mainstay on Seth MacFarlane’s animated comedy since his debut in season two in the episode entitled Fifteen Minutes of Shame. 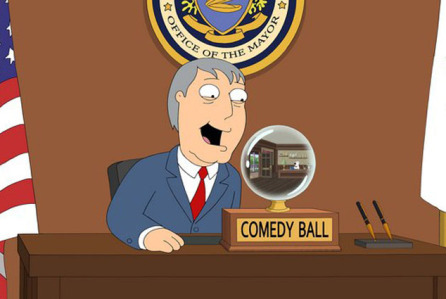 West voiced Quahog’s mayor, also called Adam West, until he sadly died at the age of 88 on June 9. Appearing in 111 episodes, Family Guy paid tribute to the great actor yesterday by releasing a compilation online of his funniest moments in a video simply titled, ‘In loving memory of Adam West’. The perfect compilation features many great clips including his first appearance in the show when he repeatedly says ‘thank you’ to the citizens and the time he played Grand Moff Tarkin in the Star Wars parody ‘Blue Harvest‘. West is due to make sporadic appearances as the mayor in season 15 but thankfully it has been stated that no one will come in to voice the character in West’s place. Adam West, and his mayor, will be missed.